* Infiltrating Al Qaeda scientist Rauf Ahmad did a lot more than have a servant serve tea and cookies to his US interrogators at a comfortable ISI safehouse « CASE CLOSED … what really happened in the 2001 anthrax attacks? This entry was posted on April 26, 2015 at 4:44 am	and is filed under Uncategorized. Tagged: *** 2001 anthrax attacks, *** Amerithrax, *** FBI anthrax investigation, Rauf Ahmad. You can follow any responses to this entry through the RSS 2.0 feed. You can skip to the end and leave a response. Pinging is currently not allowed. A 2016 West Point study found that while ISIS has long advertised its desire to obtain and use sophisticated biological weapons, the group faced ‘significant practical challenges’ in the endeavor, including the lack of sophisticated personnel and technology, and sufficiently reliable power grid in the territory it controlled. ‘Biological weapons are very unlikely to be developed by the Islamic State as a mass casualty tool,’ the report said. Earthquakes, volcanic eruptions, searing heat — and the best ISIS can do is recommend its supporters to go rummaging around the ubiquitous feces of San Francisco homeless? At the same time, Bin Laden’s son, yet another momma’s boy, is being urged by his mom to just continue to bring Ayman Zawahiri’s tea and be his gopher? With President Trump’s resignation increasingly possible — due to the suspected perjury by Don Trump, Jr. before Congress — Ayman Zawahiri might better just find a good retirement home and STFU. Even when FBI Director Mueller’s critics regularly suggest he botched Amerithrax, his biggest “whodunnit,” the FBI, it seems, has been very successful in tamping down the threat domestically. Media outlets (a blogger, Daily Mail) perhaps should not even bother report this “call to biological arms” by ISIS. All the “call” does is bespeak the impotence that Ayman Zawahiri and his ilk have demonstrated for many years. R. Scott Decker now acknowledges that 2 years after Stevens death, the FBI had still not obtained any of the Ames known to be abroad. A delay in collecting evidence risks that it is not preserved. The USAMRIID and Porton Down conducted annual in-person exchanges. Ivins, Ezzell and the others would go to the UK. Or they would come here. Those exchanges were provably infiltrated by a scientist sent by Ayman Zawahiri. R. Scott Decker knew this. A leading Ames researcher from Porton Down in Fall 2001 started working for the FBI to work on the genetics in Maryland. Decker’s failure to not collect the samples from abroad — that Mueller would allow it — is stunning. There needs to be a Congressional investigation. Decker just assumed that the Ames was not obtained abroad he says at more than one point because the writer of the letter had spelled the word “penacilin”. That doesn’t even make sense. While MSNBC-fans are consumed by the Daniels litigation — like a cat following a laser around the room — on more important fronts, things don’t appear to be going well for the President in the Russia investigation. Grabbing the phones of Russian oligarchs at the border shows former FBI Director Mueller’s investigation continues to reach out to develop relevant facts. They recently searched a storage locker kept by Manafort. Amerithrax was more difficult. IMO, it partly was because Adnan El-Shukrijumah was in the wind. The mastermind (above Zawahiri), Mohammed Atef, was dead. The affable Yazid Sufaat, although detained in Malaysia, was determined to be mum because he felt betrayed by his country. For his part, Yazid Sufaat pled the Fifth when I asked him what strain he was using. He was then thrown in jail for another 7 years to reflect on the benefits of being more candid about terroristic activities. Now as for what Yazid Sufaat’s assistant, Al Barq, shared upon being tortured in Jordan and Israel, we’ll never know. Sufaat’s other assistant died in combat. 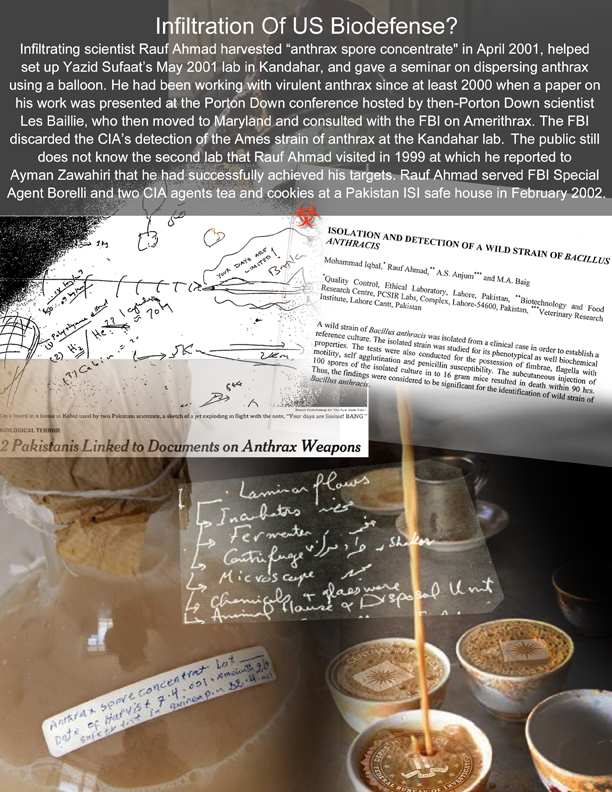 And Rauf Ahmad, the Pakistan government scientist who infiltrated the Porton Down conferences, was protected by the ISI. This Isackson seems like a smart fellow. It would be interesting to have a dialogue with such types after they read and learn about Al Qaeda’s anthrax program and its infiltrating scientists like Rauf Ahmad. The centre will be located at the Defence Science and Technology Laboratory in Porton Down, which played a key role in identifying the lethal nerve agent Novichok, used in the Salisbury attack. The government will also be offering the anthrax vaccine to “high-readiness forces” to provide them with protection against “deadly danger”. Comment: The government has suppressed information about Rauf Ahmad’s infiltration of Porton Down. Information about that infiltration is contained in the section (and outline) being withheld from Ken Dillon in his FOIA lawsuit. The federal district court judge should review the Lambert memo in camera. GAO: On Rauf’s Quest For Virulent Anthrax For Ayman Zawahiri, Was The Second Lab He Visited A BL-3 Lab at Porton Down? Was He Cleared To Go? If we don’t learn from history, we are bound to repeat it. Yet Scott Decker merely assumes that all the other labs — including the lab used to process the anthrax used in the letters — submitted all their samples. Why would they? Why would the perp have sent in proof of his or her involvement in murder? Despite Scott’s best intentions and best efforts, over the course of years — and his learned educational background — his mode of inquiry was never going to be sufficient to solve the Fall 2001 anthrax mailings. Bank robberies tend to be a tad easier. You get a picture of the perp and then you run him to the ground. Instead, the FBI should have interviewed Yazid Sufaat in December 2001 rather than waiting until November 2002. And the FBI and CIA should have interviewed Al Qaeda infiltrator Rauf Ahmad in a context other than the ISI safe house protected the government scientist, with the government scientist having a servant serve the agents tea and cookies. Trump accused Pakistan of “housing the very terrorists that we are fighting … It has much to lose by continuing to harbor criminals and terrorists. Might the thoughtful commentator Filippa Lentos, in urging that the world focus on the risk of state (rather than terrorist) misuse of biological weapons, usefully also address the fact that Zawahiri’s Rauf Ahmad was a Pakistani GOVERNMENT science who was kept at an ISI safe house and had a servant available to serve guests tea and cookies? How effective was US FBI’s attribution ever likely to be? Bioterrorism seems to be back in fashion. In the past, it has received bursts of attention that arose from particular incidents—the “anthrax letters” sent through the mail to US politicians and media outlets in 2001, for instance, or the purchase of plague bacteria by white supremacist Larry Wayne Harris in 1995. This time, it’s an unlikely individual calling attention to the bioterror threat—Bill Gates, the Microsoft founder turned philanthropist. Over the last several years, the world’s richest man has spent vast sums of money on global health, and in the last few months he has turned his attention to bioterrorism. At a high-profile security summit in Munich in February, he warned that bioterrorism could kill tens of millions. At a London security meeting a couple of months later, he said terrorists could wipe out 30 million people by weaponizing a disease such as smallpox. Mike Rogers was mentioned today as being under consideration also. Mike Rogers is more familiar than most with the Al Qaeda anthrax threat and has expressed frustration with Pakistan intelligence. We hope this note finds you well. I’m sure things are very busy for you right now! Former Congressman Mike Rogers and I invite you to join us for a salon dinner discussion on biodefense on February 22nd at 6:00 pm at the Cosmos Club in Washington D.C. As you know, biosecurity is an issue that I had the unfortunate experience of dealing with first hand when anthrax was sent to my Senate office. However, even with the anthrax attacks that took place in 2001, and the Ebola outbreak in 2014, biodefense isn’t being as seriously considered as I believe it should be. Mike, as I am sure you know, during his time in office was the Chairman of the House Intelligence Committee and a member of the House Energy and Commerce Committee. Mike built a legacy as a tireless and effective leader on biodefense, counterterrorism and national security policy. Mike currently hosts a nationally-syndicated radio show, is a CNN national security commentator, a Distinguished Fellow at the Hudson Institute and serves on the Board of Trustees at the Center for the Study of the Presidency and Congress. Last year, I had the privilege of serving on the Blue Ribbon Study Panel on Biodefense led by Governor Ridge and Senator Lieberman. Mike briefed the panel and informed our final recommendations. Now that that the panel’s report has been released, we believe we have an opportunity to elevate the political prioritization of biodefense and preparedness, as well as advance near and mid-term changes to address the challenges and gaps we continue to face. Mike and I would like to bring together a small group of thought leaders, such as yourself, for an informal discussion. Ideally, we would like to build on the discussion that the Blue Ribbon Panel Study began, and identify some actionable priorities. In the end, we hope to use the ideas gathered during the dinner discussion to develop both short-term and mid-term strategies for increasing political interest in improving our national health security. Given your experience and expertise in these areas, Mike and I are hopeful that you will be able to join us. The ISI sheltered anthrax infiltrator Rauf Ahmad. If we don’t learn from history, we are bound to repeat it. Pakistan’s Inter-Services Intelligence agency (ISI) has been protecting the Egyptian-born al-Zawahiri, a trained surgeon, since U.S. forces evicted Al-Qaeda from Afghanistan in late 2001, several authoritative sources tell Newsweek. Newsweek magazine reported that al-Zawahiri is living under the protection of Pakistan’s Inter Services Intelligence in the port city of Karachi after surviving a drone strike at a remote area near the border with Afghanistan. Al-Zawahiri, an Egypt-born and trained surgeon, has been protected by the ISI since US forces evicted Al Qaeda from Afghanistan in late 2001, the report quoted sources as saying. Putting aside Saudi Arabia and its funding of charities, does any other country have liability under the new statute, JASTA, relating to the anthrax attacks? “With the Justice Against Sponsors of Terrorism Act (JASTA) enacted, at least seven lawsuits have popped up in federal courts under the law. The suits blame the Saudi government for supporting and funding the terrorist attacks on September 11, 2001. Just six months after former President Barack Obama fiercely opposed allowing the law to be enacted and Congress went against his wishes, the lawsuits have been rolling in. It is unfortunate that after the Washington Post correspondent once had obtained permission from ISI to interview Rauf Ahmad, the ISI reneged and withdrew their permission. Perhaps the ISI felt that Rauf Ahmad was not going to be able to succeed in the massive lies that he told the FBI and CIA interrogators at the safehouse, especially that first day. (I obtained and uploaded some documents from DIA and other sources that would not have left him much wiggle room). It’s better, sometimes, to ask forgiveness than ask permission. Journalists should interview Rauf Ahmad. The network also included medical experts with whom they planned to unleash a biological attack in Kenya using anthrax. Military defence bloc Nato and the EU both agree that there are ‘justified concerns’ that Islamic State (Isis) is attempting to obtain chemical, biological and nuclear weapons to attack Western nations. The warnings come as reports suggest intelligence agencies in Italy and Germany believe that the extremists are planning a Tunisia-style attack on European beach resorts this summer. On 19 April, German media reported that Isis is sending jihadists, dressed as ice-cream salesmen, to beaches where they plan to detonate suicide vests and use high-powered assault rifles to kill indiscriminately. According to BILD the BND, the German MI6, has learned from its Italian intelligence that resorts in southern France, the Costa del Sol in Spain and both coasts in Italy are most under threat. No. The question is why Mr. Ridge didn’t respond to it by calling for hearings on the 9/11 anthrax mailings. These panel members bear part of the responsibility for the unconvincing resolution of the Fall 2001 anthrax mailings. They failed to call for hearings on the Fall 2001 incidents. They had a critical role to play but so far they have dropped the ball. So if and when Dr. Ayman Zawahiri attacks, they needn’t rush to blame others. Instead, members like Kenneth Wainstein should ask why they didn’t call for such hearings. Dr. Zawahiri is going to be writing the history whether these quasi-pharma and biodefense industry lobbyists like it or not. Folks can determine for themselves the role they are going to play in the history books. Our elected leaders have no greater responsibility than to protect and safeguard the American people. That imperative guided us when we served in public office after September 2001. Although the government has successfully addressed many homeland security challenges since then, the United States is unfortunately still underprepared to confront the biological threat. Each day, we face the possibility of an infectious disease outbreak, an intentional bioterror attack, or an accidental release of a pathogen from a research facility. Naturally occurring biothreats such as Ebola are bypassing borders to emerge on our shores. Terrorist groups like the Islamic State are devastating the Middle East while endorsing biological warfare and threatening to attack our homeland. Man-made threats are also occurring here at home in the form of safety and security lapses in our nation’s laboratories involving agents like anthrax. Rauf Ahmad in email exchanges with me over the years would never cooperate with me unless I paid him money I didn’t have — sort of like FBI FOIA. Mark Twain once said that history doesn’t repeat itself, but sometimes it rhymes. Sometimes when you dig into a mystery or treasure hunt, you have to dig deep. But in Amerithrax, it may just require that a reporter pick up the phone or dash off the right FOIA request. The Washington Post had obtained permission from ISI to have its correspondent there interview Rauf Ahmad. But then ISI backpedaled on the request. The ISI (and FBI and CIA) is afraid of any digging that it is too deep. For example, When I talk about where Dutch Schultz hid his loot, it helps to study the other things he hid underground — to include an entire distillery. What could be more fun if they throw in free wine tasting? Dutch’s Spirits in New York’s Hudson Valley offers full access to the original underground Prohibition Era bunkers at the 400-acre Harvest Homestead Farm distillery built by Dutch Schultz. Includes a guided tour of historic bunker museum. Similarly, when I urge the FBI to employ more liberal use of its backhoe and penetrating radar in the Isabella Gardner heist matter — viewing it more as a classic treasure hunt, I am merely adopting the FBI’s oft-quote mantra of leaving no stone or concrete slab unturned. At Bobby Guarente’s old place in Madison, Maine, which the FBI thinks of itself as having thoroughly searched in 2009, they in fact did not have ground penetrating radar or a backhoe. I have uploaded the pictures where “X” may mark the spot. Outside of Hartford, Bobby Gentile used to own a used car lot in 1991 at the same time he was in the concrete laying business. My source (the woman at the large business across from the interchange) tells me a small building on the property was razed a couple years before the FBI took an interest in Mr. Gentile. I love the HISTORY series and think the Michigan brothers and colleagues are great. But I wish they would reconceive of the “money pit” as a drain and consider that a treasure cache awaits them under Smith’s Cove. Absent permission to rebuild a coffer dam at Smith’s Cove, perhaps there is more sophisticated ground penetrating radar that can be used underwater in Smith’s Cove. When the US is attacked someday in the next 911, I’ll look back at David P. Sobonya’s denial of a fee request on the subject relating to Al Qaeda’s anthrax program — actually, just limited to traditional forensic reports that were done and were exculpatory of Dr. Bruce Ivins — and think to myself: Mr. Sobonya, that was really misguided in light of the public interest involved. You and your colleagues should have informed yourself. Think, too, about the fact that those who postpone blowing themselves up are developing new and improved martial skills. “They write about and share ‘Lessons Learned’ all the time,” Gen. Flynn said. He recalled that not long after Sept. 11, 2001, anthrax was used in an act of terrorism that killed five people. “If that anthrax had been dispersed more efficiently,” he said, “it could have killed a quarter-million people.” Also worth bearing in mind: Just eight years separates the first attack on New York’s World Trade Center in 1993, in which six people were killed, from the 2001 mass murders. I think choosing Michael Flynn as your Vice Presidential running mate would be a brilliant idea — shoring your campaign up in an area that gives many critics the most concern. (I know a lot of Republicans who are going to sit out the election due to concerns they have regarding national security. Picking Michael Flynn would do a lot to resolve those concerns).